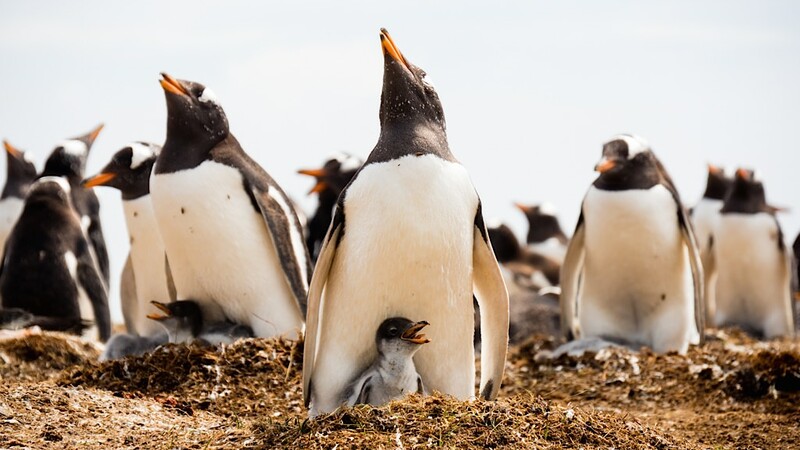 Chick Power: Gentoo Penguins and their chicks in the Falkland Islands. © 2014 Avid Travel Media Inc.
We only spent one day in the Falkland Islands on our way to Antarctica, but we saw several days worth of penguins it seemed. Yesterday, I wrote about Cute & Woolly, A New Breed Of Penguin? and the day before I posted Perfectly Paired Penguins. This photo completes my fascination with penguins — in the Falkland Islands. On the afternoon that this photo was snapped, we boarded tenders to say good-bye to Port Stanley and Seabourn Quest sailed away, leaving the Falkland Islands in her wake. Our next stop: Antarctica. But first, we had the Drake Passage to cross, which could take up to 36 hours in notoriously rough seas. I popped a Dramamine and prepared for the ride.